When the iPad first came out, we talked about how so many folks we knew was getting their fill of PBS shows streamed to their iPad through NetFlix. 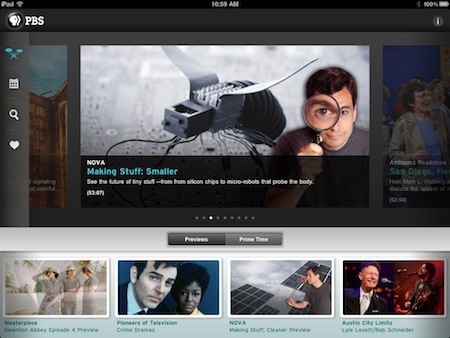 PBS has now introduced a free app for accessing their shows and show schedules. 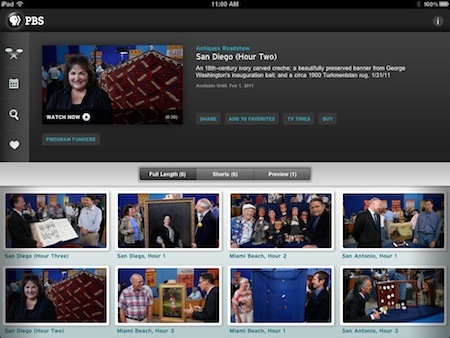 The PBS for iPad app launches into an overview which works equally well in portrait or landscape view. 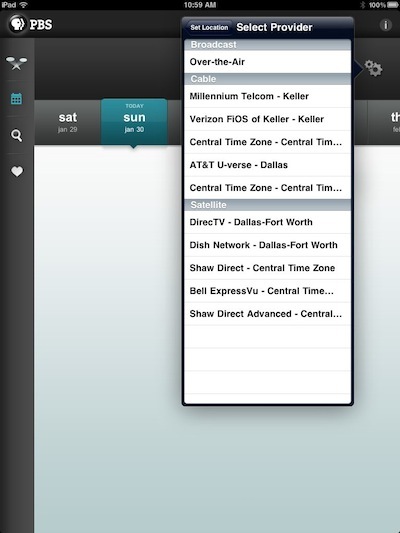 From the overview screen, you can swipe through popular show thumbnails for either ‘Previews’ or ‘Prime Time’ access. Notice that along the left if the buttons to get to these overview screen, search and to look at a listing schedule. Choose a show to drill down to the episodes available online view. 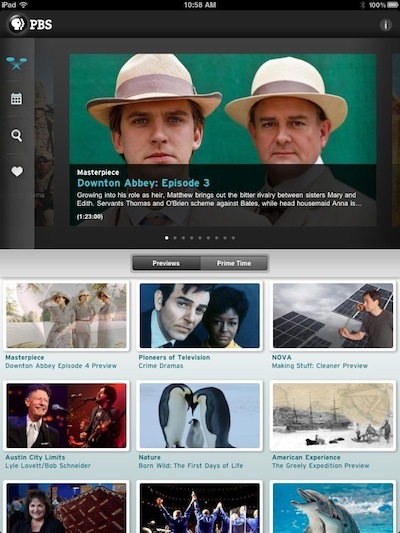 PBS for iPad acts like a tuned access point for your iPad rather than having to use the browser. You are also provided the option to tell others that you have found a show you live via Twitter, Facebook or in an email. Select an episode to get more information about it and tap ‘Watch Now’ to… well, watch the show. No need to wait for the next showing of a show you missed, view it on your iPad. 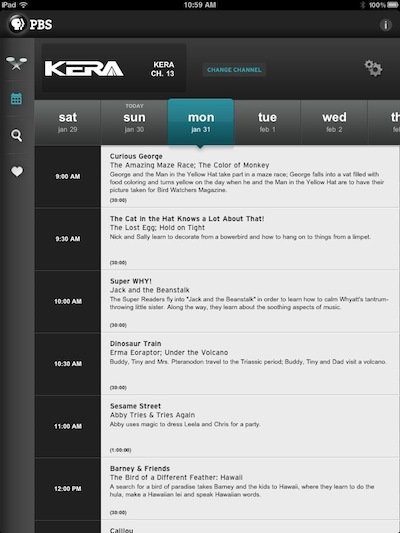 The PBS for iPad app will provide you with show times as well. The first time you visit the calendar, you are asked about the TV provider your using. This can be changed later if you choose the wrong one. The upcoming shows calendar works very well. Choosing the day gives you a nice list of the shows, a brief description and the times of showing particular to your service provider. Tapping the description doesn’t do anything so it’s good that the info is right there in the day view. The app description mentions that you can “Purchase episodes and seasons that you’d like to own”, we have not seen this within the app but understand some folks will want to keep a show from rolling off the list. * PBS primetime programs: Antiques Roadshow, Frontline, History Detectives, Masterpiece, Nature, Need to Know, Nova, Secrets of the Dead, and more. * Austin City Limits song performances. * Special clips and full-length episodes from the PBS special CIRCUS. * Original online series, including Nova ScienceNOW’s “Secret Life of Scientists” and “FutureStates” from INDEPENDENT LENS.